Located in the district of Boiro (la Coruna province), this particular castro is more worthy of a visit for its information center than that actual physical remains of the castros themselves. The castros are quite well signposted and the visitor center is a two storey building with a car park outside. 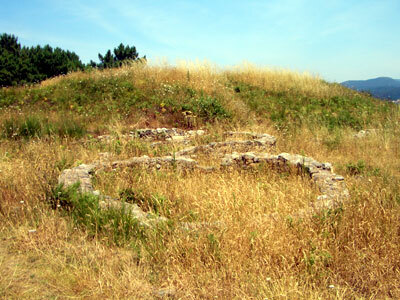 The archaeological remains are on an outcrop of land that juts out into the sea above and close to the town of Boiro, however in truth they were badly overgrown and only partially excavated. 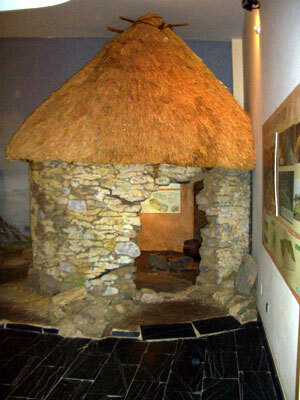 Left, this is the mock-up of an actual castro dwelling within the visitor center at the castro de Neixon. What did make our excursion worthwhile was the visitor center. 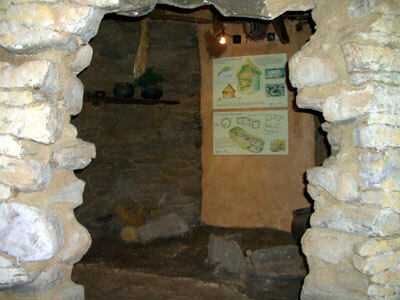 This was a new building with exhibits and findings from in and around the excavations. there was also a superb life size re-creation of one of the small castro dwellings. For once Galician tourism got things exactly right and anyone who has seen, or has an interest in, castros would appreciate what was on display. The staff, whilst not speaking English, were helpful and a leaflet about the site was available. Unlike some of Galicia's other mini museums there was no objection to the taking of photos and video. Also to their credit, we have since received emails about future developments in connection with the archaeology of Muros, suggesting that for a change tourism is being actively promoted. In summary worth seeing for the visitor center, but only if you are interested in castros and are on the way to or departing from Boiro. Right, just visible are the ruin remains of two or three castro structures. These were probably the best examples that we could find at Castro de Neixon and they were quite overgrown at the time (summer 2006). Right, again inside the museum and this time showing one of the information boards inside the reconstruction of a castro. This aspect of the museum was very good and the pictures were informative, even if you do not read the language.